LAND OF HOPE [KIBÔ NO KUNI], LOVE EXPOSURE, COLD FISH and HIMIZU director Sono Shion's story of a family affected by a Fukushima-like nuclear accident, is an uncharacteristically low-key and moving experience, says Slarek. It's a little too easy to approach Sono Shion's 2012 The Land of Hope [Kibô no Kuni] with false expectations about how it will play out. I certainly did. The problem with such presumptions is that they can prompt you to call into question a couple of Sono's decisions regarding the film's characters and story threads. Allow me to explain. As you may well be aware, the premise of The Land of Hope was inspired by the Fukushima Daiichi nuclear disaster that followed the 2011 earthquake and subsequent tsunami in Tôhoku, Japan. Despite the stylised and occasionally extreme nature of much of Sono's previous work (try a double bill of Love Exposure and Cold Fish is you're looking for evidence of both), advanced word suggested that the focus of The Land of Hope was to be how those living close to such a disaster would cope with the immediate aftermath, suggesting a low key and true-to-life portrait of stoic resilience in the face of severe adversity. It's a preconception that the opening few minutes do little to contradict, as the Ono family – consisting of ageing father Yasuhiko, his dementia-afflicted wife Chieko, his son Yoichi and Yoich's pregnant wife Izumi – are observed attending to their duties on the family milk farm with almost documentary authenticity. When the earthquake hits, it is handled with surprising and economical minimalism, a distant rumble, a house-shaking tremor and a fade to black. The family is left rattled but the house is still standing and the livestock unharmed. The phone lines are down and Yasuhiko is worried about the nearby nuclear plant. "Did you hear an evacuation announcement?" he asks his neighbour Suzuki's son Mitsuru, who has just arrived home safely with his girlfriend Yoko. In the end there is nothing they can do but bed down for the night and wait to see what morning might bring. Yasuhiko is awakened by a public proclamation that a 20km circle around the Nagashima nuclear reactor is being cordoned off. As he walks into his garden a small battalion of busy officials in protective suits arrive to begin setting up barriers and evacuating those whose houses fall within the exclusion zone. The barrier cuts through the middle of the Ono property, placing their house just outside of the officially designated danger zone and their neighbours inside it. Confusion reigns, as those tasked with setting up the barrier all but refuse to communicate with the angry and frightened residents and the Suzuki family are hurriedly bundled up and driven away. Once the officials have departed, Yasuhiko tells Yoichi and Izumi that they should leave to protect their baby. "We're old," he reminds them, "too old to worry about radiation." Following Yoichi and Izumi's departure, the storyline undergoes a three-way split: the resolute Yasuhiko and the blissfully unaware Chieko attend to their garden, feed their cows and take care of the dog that their immediate neighbours were forbidden from taking with them; Mitsuru and Yoko leave the shelter at which the Suzuki family have been billeted and head off to look for Yoko's parents in an area badly hit by the post-earthquake tsunami; Yoichi and Izumi establish themselves in a new town, where books given to them by Yasuhiko start Izumi on a fast road to pathological radiophobia. It's the manner in which this third strand is developed that prompted my above-mentioned questioning of Sono's approach. Where the first two stories are handled in captivatingly low-key manner, the third takes a real world issue and runs with it to an almost surrealistic degree, as Izumi's radiophobia mutates with dizzying rapidity from buying protective face masks to sealing their new apartment in plastic sheeting, wearing a radiation suit for all public excursions (including her prenatal appointments at the hospital) and hallucinating radioactivity as an all-encompassing red cloud of death. This drift away from the earlier subtlety is emphasised by Yoichi's propensity for angrily bellowing in moments of emotional crisis and a too-literal visualisation of the metaphorical stakes that divide him from his father. Yet there is still much in this story that is quietly effective, from the manner in which Yoichi confronts the trio of women who giggle at his wife's protective attire to his later return to the farm to try to convince his father to leave. It's also easy to misjudge elements that have a cultural truth that we in the west may not be aware of. I was sceptical, for instance, of the idea that a petrol station attendant would refuse to serve the couple through fear of radioactive contamination based solely on where they had driven from, but an older Japanese friend assured me that this very prejudice was common in Japan in the years immediately following the atomic bomb attacks on Hiroshima and Nagasaki. 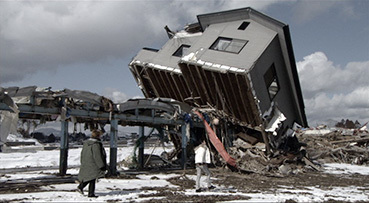 More subtly and soberly handled is Mitsuru and Yoko's journey into the disaster area, filmed in Fukushima on similar locations to those used only months earlier by Sono for Himizu, an area hauntingly stripped of its population and most of its buildings (in the astonishing wide shot pictured above, an entire house appears to have been picked up and dropped at a 45 degree angle). As the couple stand by the tattered remnants of a house and Yoko yells repeatedly at the distant remains of the ghost town that her former home has become, the sense of the widespread devastation left by the tsunami is keenly communicated. Even the snow that falls only in the disaster area – actually the result of an unseasonably heavy snowfall midway through the shoot when the crew switched locations – feels symbolic of the desolation the area has suffered. But the heart of the film lies in the story of Yasuhiko's calm resolve and his unconditional love for Chieko, made touchingly real by two pitch-perfect performances from Natsuyagi Isao and Ôtani Naoko. Yasuhiko's refusal to leave, in spite of the ever present threat of contamination and the gentle pressure exerted by the pair of mismatched local officials, becomes both a line in the sand and an increasingly sad acceptance that their time on this earth is drawing to a close. This attachment to their home eventually proves infectious, as their tale of how Chieko lost her engagement ring beguiles even the previously irritable young official Kato, prompting an unexpected but surprisingly touching rethink of his dismissive attitude to the couple's resistance and a pause to revisit a spot that was special to him in his own now lost youth. It is our close engagement with the couple that makes Yasuhiko's desperate search for Chieko after she wanders into the danger zone – trapped in the memories of her younger days and drawn to a non-existent festival she is desperate to dance at – so tense and affecting, and the semi-improvised bon odiri dance that concludes it so magical. That their story could be heading for an unhappy ending is telegraphed from an early stage, but this in no way lessens its emotional impact. Surprisingly, perhaps, it's in the conclusion to Yoichi and Izumi's story that the film makes good on the promise of its title, underscored by the one-step-a-time chant and march that Mitsuru and Yoko have learnt from two disaster zone children whose appearance is fleeting and whose earthly existence is never confirmed. Despite flirting with emotional cliché, this makes for a moving and oddly satisfying conclusion, leaving us with the suggestion that in order to triumph over adversity, we sometimes, for better or worse, have to learn to live with it. Framed 1.85:1 and anamorphically enhanced, this a strong transfer in every respect, boasting an impressive level of detail for DVD and handsome and largely natural colour reproduction, something particularly evident in the brightly coloured flowers in the Ono's garden. Contrast is generally excellent and even holds its own in darker scenes without sucking in too much picture detail. There's not a dust spot to be seen and the low level of what looks like digital grain suggests the film was shot on HD, something the brief glimpses of the camera in the making-of documentary seem to confirm. On the whole a very fine transfer – I'll bet the Blu-ray looks superb. A clean and clear Japanese Dolby 5.1 surround soundtrack is largely front weighted, with the surrounds intermittently and subtly employed for ambient sound at exterior locations and the frontal separation of effects sometimes distinct. In keeping with the tone of the film, the soundtrack rarely shouts, but when it does – as with Izumi's radiation cloud hallucination – the volume and bass punch are impressive. A detailed and involving behind-the-scenes documentary with its share of real surprises. The first comes early on with the revelation that the story was not only inspired by a real family – the Suzukis – whom Sono encountered when searching for a way into the 20km Fukushima exclusion zone, but that the Ono family scenes were shot in and around their home, whose grounds were also cut in half by the barrier. It was also their tree, one they planted many years ago, that the filmmakers set fire to for the symbolic climax – pleasingly, it is shown later to be recovering from this trauma. I was also surprised to see that the barrier used in the film, which I'd taken to be a symbolic exaggeration, was directly based on its real world equivalent. 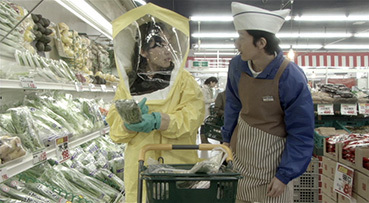 The problems of raising the budget for such a film in Japan are touched on (funding was eventually secured from Taiwan, Germany and Third Window Films in the UK), as is the decision to set the film in a fictional prefecture and town, and Sono is clear about wanting to ensure that those affected by the Fukushima radiation are not forgotten or ignored. Many of the actors are interviewed about their involvement with the project, and the film gets a most appropriate world premiere in the Suzukis' living room, where it is watched by them and their neighbours while Sono paces nervously outside with a cigarette. Their positive reaction – "The film is our spokesman," says one of them in all sincerity – buys Sono and the project some serious credibility, and Sono himself is clearly committed to the film's cause, evidenced by his involvement with the communities in which he filmed and his volunteer work at refugee houses. An essential extra feature. The original Japanese trailer with some added English phrases. Not bad, but does make the film look more (melo-) dramatic than it is. Not a typical Sono Shion film, if there can be said to be such a thing, something recognised and fully intended by the director, who in the making-of documentary states that he didn't want the Ono family to be "too much like typical Sono characters." Despite my reservations about the overplayed symbolism and near-surreality of aspects of Yoichi and Izumi's story, this is still a gripping, intelligent and deeply moving work, and a noble and thoughtful testament to the too-often forgotten victims of a disaster that has just recently found itself once again back in the news. Full marks to Third Window on all fronts here, for helping to fund the film and for producing a fine DVD (and, I'll wager, and even crisper Blu-ray). Indeed, the making-of documentary is so revealing that it's worth owning on disc for the transforming effect that it has on how you view the main feature. Enthusiastically recommended. The Japanese convention of family name first has been used for all Japanese names in this review.